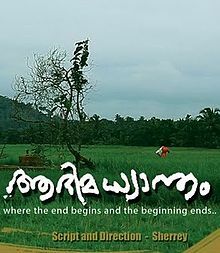 Adimadhyantham (meaning: The Beginning, The Middle and The End) is a 2011 Malayalam film written and directed by debutant Sherrey and produced by Late P. Rasheed, starring Prajith and Sajitha Madathil in the lead roles. The film tells the story of a deaf Vedan boy from northern Kerala named Ekalavyan, who has to follow and perform some traditional tribal rituals to carry forward his family tradition in Theyyam and traditional beliefs. The boy, who is speech-and hearing-impaired, whose fears about death and loneliness forms the main thread of its story. The boy experiences days and nights differently and has nightmares about death. Adimadhyantham won a special mention award at the 59th National Film Awards of India . The film is yet to get a theatrical release, though received generally positive reviews in its premiere show during the 16th International Film Festival of kerala(IFFK)held at Trivandrum. The film also won the 14th John Abraham award for Best Malayalam film by Federation of Film Societies of India, Kerala region.